October 1-7 was Mental Illness Awareness Week, and today is World Mental Health Day. 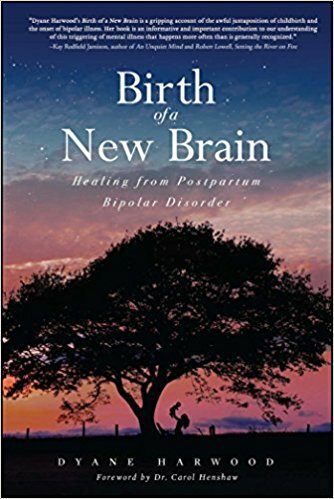 In honor of both of those we are reviewing Birth of a New Brain: Healing from Postpartum Bipolar Disorder by Dyane Harwood. Details at the end of this post on how to enter to win an EBOOK copy of Birth of a New Brain, and a link to purchase it from Amazon. Dyane’s diagnosis of Postpartum Bipolar Disorder was triggered by the birth of her second daughter in which she exhibited a hypomanic and manic episode. She experienced symptoms of hypographia, insomnia, and pressured speech. Dyane Harwood graduated from the University of California, Santa Cruz. Through her life she was able to manage being a successful student, living independently, and was able to establish various careers. She struggled finding the ideal romantic relationship and perfect career which only exacerbated her symptoms. However, she had the unconditional love of her family, friends, and dogs Tara and Shera. Through turmoil, she sought mental health services and began taking medication. She realized that her Bipolar Disorder diagnosis was hereditary. Dyane’s father was living with bipolar disorder, and she witnessed his symptomology growing up. They always shared love and support with one another which gave her strength. Dyane battled with depression and suicidal ideation. As a result, she was admitted to psychiatric hospitals multiple times. Dyane had a difficult time finding the right medication. She tried to taper off her medications and find other holistic ways to achieve wellness. However, her symptoms would arise causing much distress. She found hope when she began ECT (Electroconvulsive Therapy). “Birth of New Brain” is an amazing masterpiece that demonstrates that you can find healing even through the most difficult times in your life. Dyane was married to her husband Craig, and he is very supportive. Her dog was her flower girl at her wedding, which made me smile. She has two wonderful daughters Avonlea and Marilla. She has a beautiful family. Dyane’s healing came through self-care, ECT, therapy, medication, family and friends support, her dogs, exercise, and holistic health. Dyane’s mantra is that, “Healing is an ongoing journey.” Dyane Harwood is a mental health advocate who began a DBSA (Bipolar Depression Support Alliance) chapter support group. Dyane Harwood’s triumphant journey unveils the Birth of a New Brain. To enter to win an EBOOK copy of Birth of a New Brain, simply email KRL at krlcontests@gmail[dot]com by replacing the [dot] with a period, and with the subject line “brain,” or comment on this article. A winner will be chosen October 14, 2017. U.S. residents only. If entering via email please include your mailing address, and if via comment please include your email address. Maricela Estrada-Moreno is the author of Bipolar Girl: My Psychotic Self and recently released a second edition of Bipolar Girl. She lives a happy and stable life in Los Angeles, California, with her husband and emotional support dog, Gypsy Blue. She works as a Medical Case Worker for the Los Angeles County Department of Mental Health and is a public speaker and blogger dedicated in decreasing the stigma associated with mental illness. She found healing through music, art, spirituality, and meditation. Now she reached a path to mental health recovery and feels her destiny is to help others living with mental illness. You can find out more on her website. Thank you, Maricela, for such a beautiful and moving review! It brought tears to my eyes and it was one of the best highlights of today! And special thanks to Lorie for making this opportunity possible in the first place; I’m very honored to have my book featured in Kings River Life! Your welcome! It truly an amazing story of mental health recovery and holistic health. I loved reading your book. Thank you for sharing it with the world. You will inspire many people and instill hope in people’s hearts. What a lovely comment! We are honored to have you here. This book sounds really interesting, it sounds inspirational, i would really like to read it, I have a mental illness too and I feel I can relate to it. Thanks so much, David. If you read it, I hope that you get a lot out of it. Even though the story features postpartum bipolar (PPBD), PPBD shares a lot of the same symptoms as others forms of bipolar, and I also discuss anxiety. Take care & thanks again for taking time to comment. I strongly feel that this book will impact people in a positive way. I live with a disability and am excited to read this book. Thank you Dyane Hardwood for sharing your story! I can’t wait to pick this up! It sounds like a very eye-opening, and inspirational book. It’s amazing to read about how others overcome their hardships and triumph in the end. Thanks so much for your comment. I really hope you enjoy reading the book! I had my first book signing last week. I also gave an educational presentation to the audience which included my now-ten-year-old daughter Marilla. The evening was a challenging (Public speaking is not my comfort zone, LOL!) and wonderful experience. I hope that you have a great day & thanks again for taking time to write!